The Archives of Michigan is the repository of the governmental records of Michigan. It houses records from state and local governments, public institutions, some organizations and some individuals. Records date back to 1792. Many of the Archives holdings are being digitized at Seeking Michigan.org. Another blog post about using Seeking Michigan can be found here. Anyone who plans to visit the Archives of Michigan will make better use of their time with some advanced planning. This research checklist will give you the information you need for a visit. Important things to remember: 1) Check the hours of operation and 2) Bring a photo ID or driver's license. Researchers need a research card and you will need ID to get one. The staff at the Archives of Michigan is awesome and available to help you, but if you want to make your research go smoother you will need to bring some information with you. Knowing dates and places and how your research subject interacted with the government is needed. It helps if you know what specific records you would like to search. If you are looking for land records, land descriptions help. If you are looking for probate records, the date of death and county of death are needed. If you are looking for Prison Records, the time period of incarceration is helpful. The more information you can bring with you, the better your chance of success will be. The Archives of Michigan offers online guides and indexes to make your preparation easier. The Guides do just that-guide you to archival material by subject matter. The Genealogy Research Guide #64 explains what resources are available for family history researchers. There are over 60 guides available to help you plan your trip. The Archives of Michigan has one of a kind items. For example, Guide #61-Diaries and Personal Journals has the list of what is in their holdings, subject and dates. Your ancestor's diary may not be here, but someone else during the time period is and has written about the Civil War, Spanish American War, WWI, farming, etc. They are fascinating reads. Guide #3 is for those who have black sheep in their family! The Correctional Records have prison registers back to 1839. In addition to individual records, some with mug shots, the Archives has information on the Prison itself. Maybe your ancestor received a Pardon, Guide 48 has Pardons, Paroles, Warrants and Extradition information. Guide #22 Infirmaries, Sanatoria, and Poor Homes has institutional information. Records that provide confidential information will need a copy of the person's death certificate to access. County infirmaries and county poor home records do not have such restrictions. If you are interested in this type of information, a call, or email, to the Archives may be best. Lumbering, Logging and Forestry is an important part of Michigan History. Guide #28 shows what is available in that subject. Were your ancestors involved in mining? Guide #25 is the one you want. A variety of school records are available at the Archives. Check Guide #11 for what schools and dates are covered. I have highlighted just a few of the over 60 guides available in .pdf format, be sure to check here for a listing of all. Detroit News Index-A subject index for the Detroit News with over a million index cards. Be prepared to use a variety of search techniques when using these cards. Once you find a card you are interested in you can view the clipping at the Archives. If you want to see the newspaper, you will have to visit the Library of Michigan. Naturalization Index-most naturalization records are indexed by county and not all counties have donated their records to the Archives. For more information on Naturalization and Immigration records at the Archives, click here. Eventually, the Naturalization records will be available at Seeking Michigan. If you want to help index them, there is an indexing project ongoing. Military Index-Search by conflict to find your ancestor's record. Photograph Index-contains a portrait, Civilian Conservation Corp, and general photo collection. All of these indexes are available to help researchers prepare for a visit to the Archives. A little preparation will make your trip to the Archives successful. Archives staff is available to help you from 8-5, Monday through Friday, via telephone at 517-373-3559 or email them at archives@michigan.gov Onsite research hours are 1-5 Monday through Friday and Saturdays 10-4. National Genealogical Society is offering a research trip to the Library and Archives of Michigan, Tuesday 1 May 2018. If this is your first visit, you may want to do a little pre-planning. I hope the information below will help. You may have planned to extend your conference trip with a visit to Lansing. It is less than 70 miles driving distance. No matter how you plan to visit the information will come in handy. The Library of Michigan is located at 702 W. Kalamazoo St. Lansing, Michigan in the Michigan Library and Historical Center Building. The Archives of Michigan and Historical Museum are here, too. I created a repository checklist. Feel free to copy it for your own use. Otherwise, the important information is below. Admission is free to the library. They are open Monday through Friday from 10:00 a.m. to 5:00 p.m. and Saturdays 10:00 am-4 pm, except state holidays. Parking is available next to the museum with entrance to the circle drive on Kalamazoo Street. The cost is $1 an hour; maximum of $8. If driving, a credit card is required for entry, and payment is made upon exiting. Visa, Master Card and Discover are accepted; no American Express. Weekend parking is free. Food is available on the 1st floor or you may bring your own and eat in the snack shop eating area. No food or drink is allowed in the library. Local restaurants are 4-5 blocks east of the library on the other side of the state Capitol. ANSWER is the library card catalog. Using this before you visit the library will give you more time for research. Be sure to check the location of the material you are interested in. If an item you are looking for is located at the Archives of Michigan, don't fret, it is in the same building. I will be writing about the Archives next. One of the great collections is the library's newspaper collection. They have newspapers from before Michigan became a state in 1837. The microfilm newspaper collection has papers from all 83 Michigan counties. You can research what newspapers are available online. You can search by county or if you don't know the county you can search by the first letter of the cities name. During a recent visit, I was excited to see they had the September 1950 Mining Journal from Marquette, Michigan. The library in Marquette didn't have the paper from that year. I enjoyed the one stop researching. Researching my ancestors from the Upper Peninsula to Southeast Michigan was done in one day and one place. Other materials of interest at the library include city and county histories, vital records, cemetery transcripts, plat maps, church histories, and more. The staff at the Library of Michigan is awesome. They are available to help you with newspaper scanning, finding materials, using their Answer catalog and more. Your starting place for a visit to the Library of Michigan is at their website. Everything you need to know is on the website. 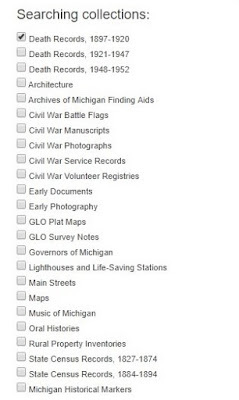 The premiere genealogy websites for the state of Michigan is SeekingMichigan.org . The website is a must use resource for Michigan family history research. If you are planning on coming to Michigan for the National Genealogical Society's 2018 Family History Conference in Grand Rapids, Michigan and have Michigan roots, this is the website to check before you come. Seeking Michigan is the online platform for the Michigan Historical Center, which houses the Library of Michigan and the Archives of Michigan, as well as a museum and more. Currently, there are more than a million records online. This is a continual work in progress with more being added as they become available. Otherwise, you can jump right into it. Across the top you will see words such as Seek, Discover, Look, Learn, etc. If you hover your mouse for computer users, or tap the word for tablet or smart phone users, you will see a drop down list of what is available for each section. Indexes: specific information and access to four index collections: Detroit News Index, Naturalization Index, Military Index, and Photograph Index. Visit: information for those who plan to visit, including hours, location, and what to bring. County Clerk: a list of all the counties and where the county clerks are located. Under Discover, this is where the records are found! Civil War-a treasure trove of materials from the Archives collection. Letters, diaries, photographs, volunteer registries, battle flags and more can be found in this section. The Learn sections is where information on statehood, state Capital, state symbols, Governor's Decision Project, and Museums Programs can be found. 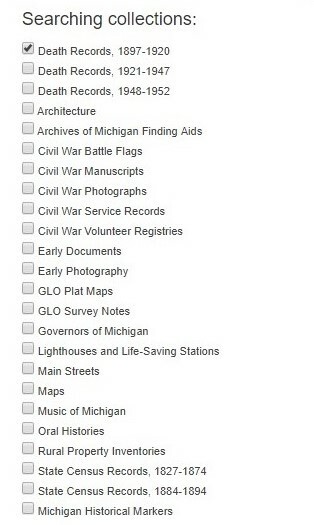 Services is an area where if you are unable to visit the Michigan Historical Center, you can order documents. A list, including prices, is found here. On the right side is a list of collections. I find searching one collection at a time works best. Select the collection you would like to search. Next, enter your search parameters, on the left side of the page. There are many options for searching. The most used records are the death records. Here are a few tips for successful death record searching. The arrows under each section will lead to choices for searching. The field section is where you can search by given name, last name, birth year, death year, county, city, date, age, father's given name, etc or any combination of above. You can add as many fields as you want. I have been known to search by county and death year only, and had success because the name was recorded incorrectly. Death records until 1941, and soon 1942, have the actual image of the death certificate. You can download a copy to your computer or print it. 1943 to 1952 records will be an index only. Each year another year of death certificate images is added. 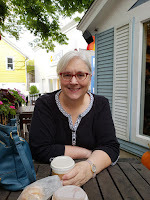 Using SeekingMichigan.org is a great starting place for Michigan genealogy research. If you plan on researching in connection with conferencing, check this website out. It will save you time.